Circulatory Massage is also known as Swedish Massage. It is relaxing and may be performed at varying pressure from light to deeper work. This therapeutic style of massage has many benefits. Its primary benefit is to move fluids in the tissue increasing circulation of blood and lymphatic fluid. This helps the body to remove toxins and other metabolic waste. It also helps to reduce stress, lower blood pressure, and increases flexibility which makes it great pre and post workout. Best of all it is relaxing and promotes a sense of well-being. Proper draping is always used and only the area being worked on will be undraped. Tight, inflexible fascia can pull on muscles and other structures causing tension, pain, and limited mobility. Myofascial Release is a form of Structural Bodywork that utilizes sustained traction or compression to release and lengthen both fascia and muscles. Pregnancy is such as special time in a woman’s life. The changes a woman’s body undergoes during pregnancy are astounding and may cause discomfort for the mother-to-be, especially in the second and third trimester. Massage is a wonderful way to help ease the discomfort, increase circulation and most importantly, alleviate stress. In our everyday lives we create and learn patterns so that we can function more efficiently. Patterns free us from having to relearn tasks over and over again. As wonderful as patterns are, we experience a limited repertoire of movement in our daily lives. Sensory Repatterning is a technique that moves the body outside of those patterns to integrate body, mind and soul by using a simple tool – passive motion. Rhythmic rocking, cradling and passive joint movements are used to allow the body to explore kinesthetic awareness. Sensory Repatterning has many benefits. A body in motion improves joint health, helps circulation, stimulates brain activity, connects us to our core, creates feelings and stimulates the flow of energy. Come to your session wearing loose, comfortable clothing. A break for beauty for people on-the-go… Includes a deep cleanse with the Ultrasonic Spatula* or My Skin Buddy*, exfoliation, masque, lip and eye treatment, toner, moisturizer and eye cream. Kansa is the Indian name for a type of bronze used in Ayerveda. Throughout the ages it has been known as the “healing metal”. 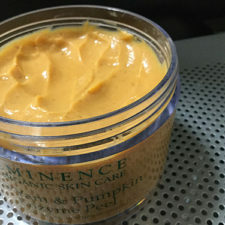 It is capable of conducting the subtle electrical charges on the skin which gives it the capacity to rebalance and restore the flow of energy in the meridians and chakras as well as reducing puffiness, promoting lymph drainage, increasing circulation, reducing the appearance of wrinkles, and may help to firm the skin. In addition to the physical benefits, Kansa wand facial massage is deeply relaxing and meditative. Includes a deep cleanse with the Ultrasonic Spatula* or My Skin Buddy*, mild exfoliation, Kansa wand facial massage with a blend of jojoba and sesame oils, toner, serum, moisturizer, eye cream, lip balm. Refreshment for your skin… Includes a deep cleanse with the Ultrasonic Spatula* or My Skin Buddy*, exfoliation, massage, extractions, masque, lip and eye treatment, hand treatment, mini hand and foot massage, toner, moisturizer and eye cream. Sometimes there just isn’t enough time in the day, or in a facial, especially when acne is your concern. If extra time for extractions and a good round of high frequency is what you are looking for, this treatment is just for you. The Hydra Medic Facial by Repechage or Eminence Organic Skin Care will leave your skin feeling clean and hydrated. Includes a deep cleanse with the Ultrasonic Spatula* or My Skin Buddy*, exfoliation, extractions, high frequency, if not contraindicated, masque, eye and lip treatment, hand treatment, mini hand and foot massage, toner, serum, moisturizer, eye cream. Massage may be included depending on the treatment chosen. Take your time and unwind. Wake-up to refreshed skin and soul… Includes a deep cleanse with the Ultrasonic Spatula* or My Skin Buddy*, exfoliation, massage, extractions, masque, lip and eye treatment, hand and foot treatment, mini hand and foot massage, toner, moisturizer and eye cream. Get your skin smooth and glowing with tikitibü’s newest addition – The Aqua Peel. The AgE System Aqua Peel Machine exfoliates while it deep cleans leaving your skin feeling super smooth with no downtime. It is so gentle that it may be performed once a week. My Skin Buddy* with LED is included in this treatment to allow for greater penetration of targeted serums and masques for your skin concerns. Includes a double cleanse with the Ultrasonic Spatula* or My Skin Buddy*, massage, Aqua Peel (face, neck decollete), eye and lip treatment, serum treatment with My Skin Buddy*, eye and lip treatment, hand treatment, mini hand and foot massage, toner, serum, moisturizer and eye cream. Short on time? No worries! The Aqua Peel Express Treatment is the perfect pick me up for your skin! Includes a double cleanse with the Ultrasonic Spatula* or My Skin Buddy*, Aqua Peel (face and neck) masque, eye and lip treatment, toner, serum, moisturizer and eye cream. Aging skin is a not so fun fact of life. You can fight it or embrace it gracefully. Myolift Microcurrent helps you do both, smoothing the road along the way. Microcurrent uses a very low level electrical current that mimics the body’s own current to help tone facial muscles, lessen those lines, increase cell metabolism, increase circulation, firm sagging skin, increase collagen production and skin hydration. The result? Smoother, softer, toned skin! The results are cumulative so a series is highly recommended. It is also a great pre-event treatment on its own. Includes a double cleanse with the Ultrasonic Spatula* or My Skin Buddy*, mild exfoliation, microcurrent treatment, toner, Viktoria DeAnn Peptide Serum, moisturizer and eye cream. This Facial Treatment with the ReZENerate Pen painlessly creates hundreds of thousands of superficial microscopic permeations on the surface of the skin. It allows for greater absorption of nutrients introduced into the skin during the treatment. Each treatment is customized and relaxing with no downtime. 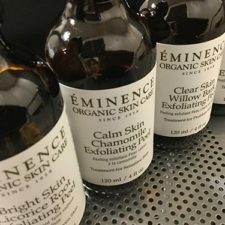 Includes a double cleanse with the Ultrasonic Spatula* or My Skin Buddy* , mild exfoliation, ReZENerate treatment with serums, Alginate cooling mask, toner, moisturizer and eye cream. ReZENerate and then some with the ChicBD™ Infusion. The ChicBD™ serum is infused into the skin with the ReZENerate pen for greater absorption. It is great for acne, rosacea and anti-aging. This nourishing serum contains Hemp oil, which is a rich source of Gamma-linoleic acid, Moringa seed oil and plant terpenes. Gamma-linoleic acid acts as a powerful anti-inflammatory while simultaneously encouraging skin growth and new cell regeneration. Includes a double cleanse with the Ultrasonic Spatula* or My Skin Buddy*, ReZENerate treatment, Alginate cooling mask and eye cream. After treatment please allow the serum to stay on the skin for several hours, preferably overnight. A relaxing treatment that deep cleans, exfoliates and hydrates the back… Includes a deep cleanse, exfoliation, massage, extractions, masque, toner and moisturizer. 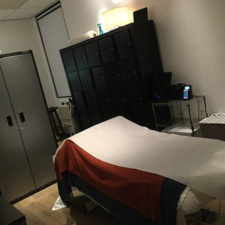 Facial and Massage together at last! 60 min. Facial and 30 min.Massage. 60 minute massage and 60 minute facial combination. A mini vacation that will leave you feeling fabulous without packing your bags. Includes 60 minute massage followed by a Happy Hour facial. Customize your service with these a la carte add-ons.